When you can't talk and don't have hands but REALLY want something, you have to get creative when asking for it. 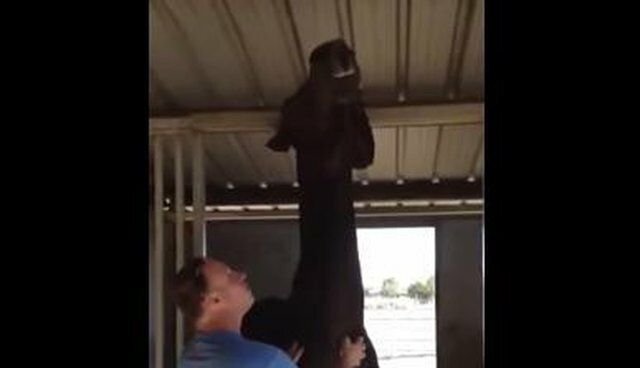 Levi the horse really loves to be scratched and was not too happy when his new friend stopped scratching him - and so he told him so. Only he couldn't do it with words. And he couldn't tell him by grabbing him with his hooves. So he came up with an even better strategy. Levi the horse pulls his friend back toward him with his head in order to keep receiving scratches. Now that's one smart horse. If there's anything we can learn from this, it's that our animals LOVE to be pet by us - and they will find a way to be pet, no matter what. It doesn't seem like Levi's human friend will ever be able to stop scratching him again ... but hey, as long as Levi's happy, so are we.